David Wiese has extended his Sussex contract beyond 2019. The all-rounder was a key contributor for Sussex in all three formats last season, scoring 919 runs and taking 54 wickets. Wiese was one of the club’s seven championship centurions in 2018 and ended the season with the team’s second-highest average in the competition. He averaged over 50 in the Royal-London One-Day cup, hitting three half-centuries, and his 52 in the Vitality Blast semi-final helped the Sharks’ to victory against Somerset. 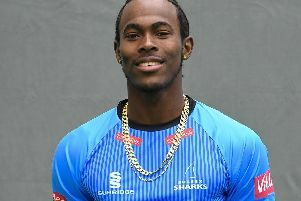 With the ball, the former South African international took 41 championship wickets including his maiden five-wicket haul for Sussex. Wiese also snared a rare Vitality Blast ‘five-fer’ against Essex in the Blast, just the fifth by a Sussex player in T20 history and the first since Chris Liddle in 2012. After committing his future to Sussex, Wiese said: “I’m delighted to have signed an extension with the club. I’ve really enjoyed my time at Sussex and have grown as a player over the past few years. Head coach Jason Gillespie added: “David was fantastic in 2018 in all forms of the game and it’s very pleasing that he has agreed to a contract extension with us. Director of cricket Keith Greenfield said: “David is a proven performer at the highest level, so we’re delighted that he’ll be continuing to contribute to our aims over the coming seasons.